Learning how to fly an aircraft like the Boeing 737 is no simple task. By the time that most pilots make it through the doors of Alaska Airlines, they already have extensive experience either flying with other airlines or in the military. No matter their background, every pilot will need to go through Alaska Airlines’ three months of additional training. Part of that training includes time in a flight simulator. 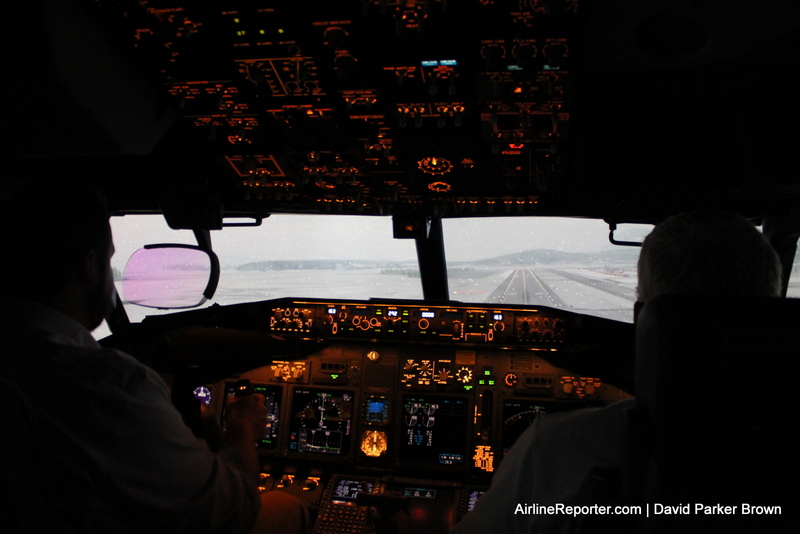 The simulators allow pilots to experience different scenarios so that, if anything ever goes wrong during a real flight, they are prepared to handle the situation. Besides being a very important safety and training tool, flight simulators can be quite entertaining for outsiders. 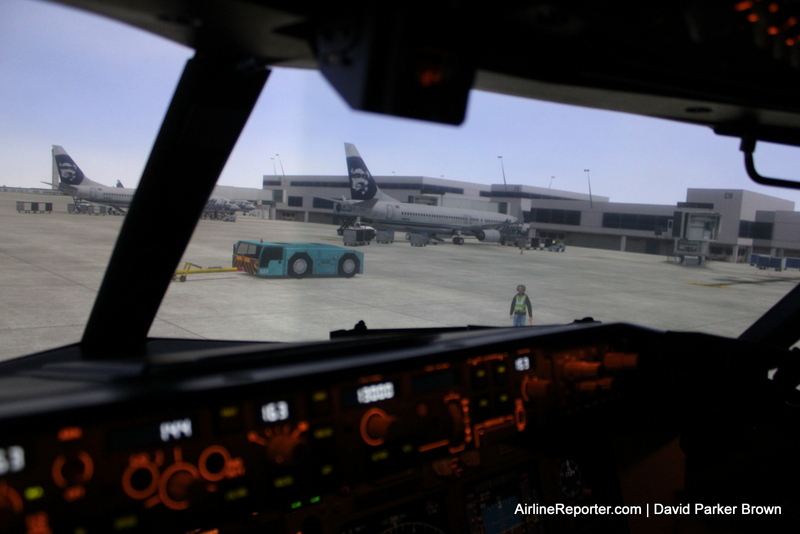 This week, I was invited to check out Alaska Airlines’ brand-new CAE 7000 Boeing 737-800 flight simulator. It is so new that pilots have not started training on it and it had a “new car” smell. The new simulator joins three others (one 737-400, one 737-700, and another 737-800) that are already at the facility. But this one is different, with the newest simulator technology, making it more real than its predecessors. Upon my arrival, I was introduced to Captain Doug Burton, who is also the Director of Flight Training. Although he is the man in charge, he allowed me to take the left seat (where the captain sits) and he took the right (where the first officer sits). I might have been in the command seat, but I barely had an idea what I was doing and was happy to have Captain Burton’s assistance. The interior of the simulator is an almost exact replica of what a real Boeing 737 flight deck would look and feel like. The obvious difference is at the rear, where there are two seats and a large touch-screen panel. This is where the instructor sits to evaluate the pilot’s work and programs almost any flight scenario. Can’t get enough? View the full installation time-lapse. Looking for an engine failure while on approach to Tampa with a crosswind of 20 knots? Done! Want to simulate a loss of hydraulic pressure during takeoff from Portland? No problem. All you need to do is hit a few buttons, and the simulator goes into action. The end goal is to make the experience as realistic as possible. Instructors want to be able to fully immerse the pilots in the flying experience. It is best if they forget that they are sitting at ground level and truly feel the sense that they are flying a real aircraft. The idea is to get pilots caught up in the moment and then instructors introduce threats and malfunctions to allow the pilots to hone their flying, communication, workload management and leadership skills. “As the level of fidelity and realism increases in simulators, this exponentially increases the level of safety as we are able to train our pilots in differing environments and situations prior to ever touching the real airplane,” Captain Burton explained. One of the ways that pilots get immersed into the experience is by the high-quality graphics used in the projection of the exterior images. I have to say that the resolution and detail in this simulator were mind-blowing. I have had the opportunity to experience about half-a-dozen simulators and this, by far, had the best visuals that I have seen. The other major aspect that plays into the realism is the ability of the simulator to move. From the sideways tilt while banking to actually being able to feel bumps on the runway, the system is designed to make one feel like they are experiencing all the movements of flight. You can even feel the gentle rumble of the engines and the landing gears locking into place before landing. After getting comfortable in my captain’s seat, it was time for us to start our simulated adventure. We began at Seattle-Tacoma International Airport at the gate on a sunny summer’s day. We were able to feel the tug attach on and push us back to where we could taxi. We could even see the ground crew member verifying that we were clear and ready to go. The details around the aircraft were quite impressive. There were other airliners, vehicles moving around the airport, and it wouldn’t have been complete without beautiful Mt. Rainier in the background. There was obviously quite a bit of detail put into the programming and I could see how one could easily get lost thinking the experience was real. Soon we were lined up for takeoff and I was ready to assist to get us up in the air. We hit V1 (the speed at which we cannot abort the takeoff), then V2 (where we have the speed to lift off), and then rotate. I was asked where I wanted to go and I decided we should fly by Paine Field, which is located up north in Everett, Washington. To show what the simulator could do, we banked steeply, causing an audible alert to blare warning us we were at an angle of more than 30 degrees. If we were a real flight, with passengers, they likely wouldn’t enjoy such an angle, but inside the simulator, it felt pretty awesome. The flight from Seattle to Paine Field (about 30 miles north) took us by downtown Seattle, which provided detailed views. After passing the city, to speed things up a bit, Captain Burton requested more power and with a few taps of the instructor’s panel we were able to travel at four times normal speed. If only real aircraft had that feature. After flying by Paine Field, it was time for us to attempt the tricky approach into Juneau International Airport in Alaska, one of the most weather challenged airports in the world. The screens went white while the new program loaded and when the images went live, I was amazed. As we set up our approach for runway 26, I couldn’t help by gaze out and be impressed with the deceptively-real mountains, complete with snow and trees. I have never flown into Juneau, but after that experience, I want to check it out in real life — it is beautiful. For the next scenario we stayed with Juneau, but instead started in the west and made an approach to runway 8. I wanted to see what this baby could do, so we asked for some turbulence and a cross wind of 20 knots. The bumps and shakes of the wind felt almost too real, but Captain Burton landed the plane pretty much perfectly — I was impressed. During the rest of my time in the simulator, we experienced snow, low fog, and an aborted landing. Each felt more real than the last and there was a time that I even forgot that we were flying in a simulator. Alaska Airlines is proud of their new piece of equipment, and they should be. It might seem like fun and games, but devices like these make sure that pilots are highly-trained, ready to handle any situation. Keeping passengers safe and happy is the name of the game, and the flight simulator is just one of many tools used to make that happen. David is the editor-in-chief of AirlineReporter.com and has loved aviation since he was a kid. Born and raised in the Seattle area has surely had an influence on his passion and he couldn’t imagine living anywhere else in the world. 5 comments on "Flying high at ground level – checking out Alaska Airlines’ newest flight simulator"
The callout sequence for takeoff is V1 Rotate V2 not V1 V2 Rotate. V1 is the abort/go airborne decision point. Rotate is to begin pulling back on the yoke to attain climb attitude and V2 is the one engine out takeoff safety speed. A nice report. I think David had a good time and also learned a bit more about Alaska Airlines. That sounds like it was a lot of fun! I heard Juneau was a tough place to land but what makes it that way? Oh and does alaska have 737-900 sim?